Sarah Silverman, 41-year-old American comedienne and actress, releases new YouTube Video yesterday titled, “Election 2012 – Voter Fraud.” As usual, it is filled with profanities – her particular word of choice is the f-bomb. Hey black people, old people, poor people, and students, what do you have in common? Lawmakers want to fuc* you in your a**hole. Tell those motherfuc**ers to go fuc* themselves. I have a yellow discharge! … but I have medicine for that. While we respect Ms. Silverman’s right to free speech and her probably genuine concern for fair elections, we were wondering if she was aware of the following? According to a report published on 24 February 2012 by the non-partisan Pew Research Center, more than 24 million voter-registration records in the United States— about one in eight — are inaccurate, out-of-date or duplicates. Nearly 2.8 million people are registered in two or more states, and perhaps 1.8 million registered voters are dead. 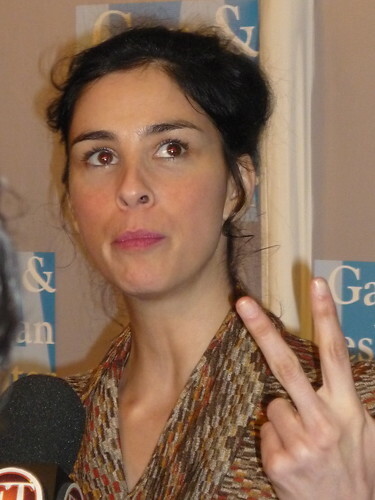 Sarah Silverman says Mitt Romney is “human garbage” because he is for traditional marriage.